Last weekend I managed a brief trip over to Canberra to attend Cancon. 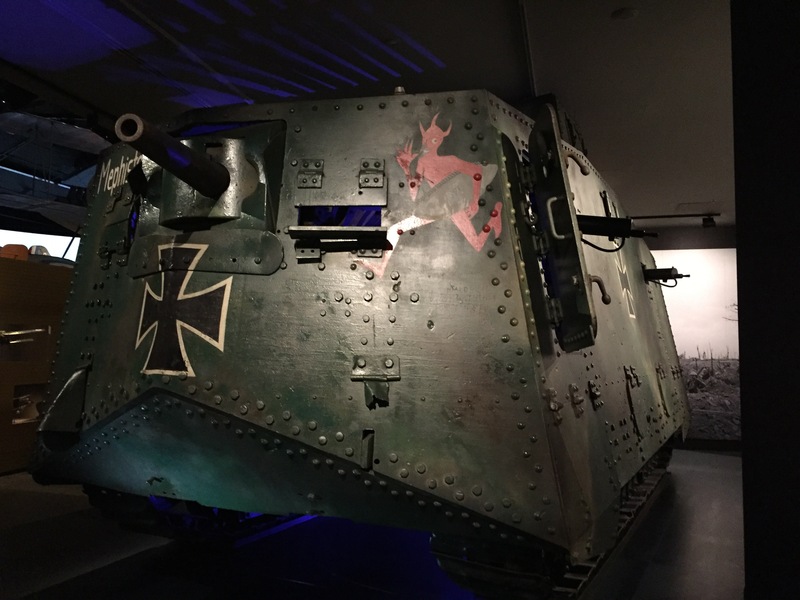 While being very much a quick trip, rather than combining it with a holiday, I did manage to call in briefly to the Australian War Memorial Museum. 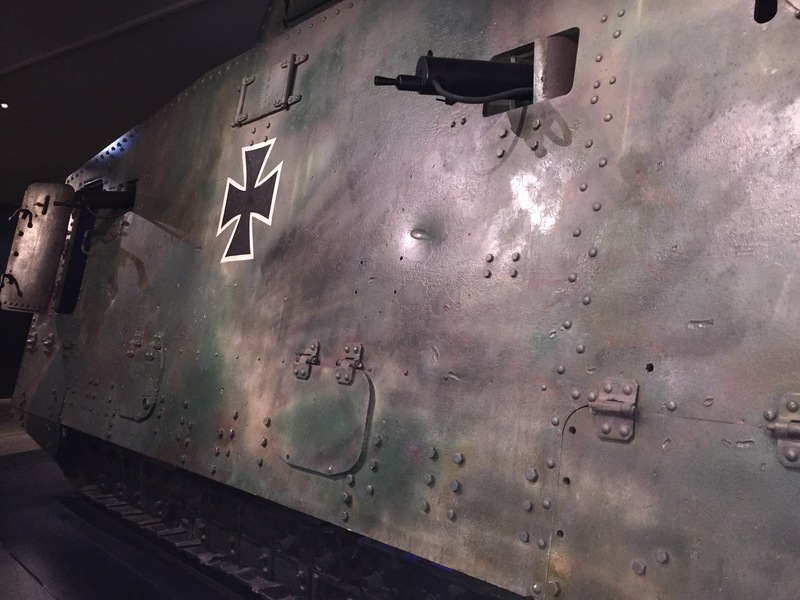 While I have visited several times I wanted to particularly visit the upgraded World War I exhibits. Above, a view from the front. Note the devil carrying a British tank. 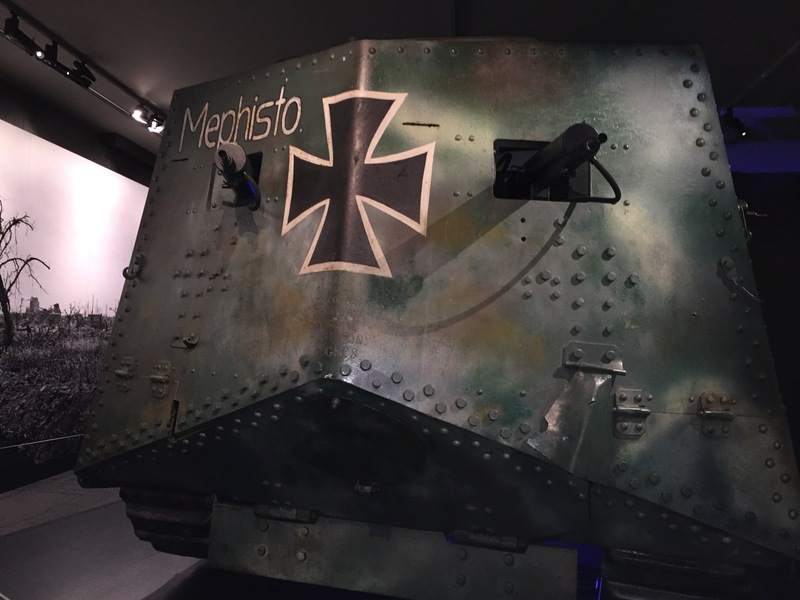 The supporting material of the exhibit outlined many of changes to markings and camouflage and the vehicles history. Below, a view of the rear. Another side view, clearly showing some battle damage. 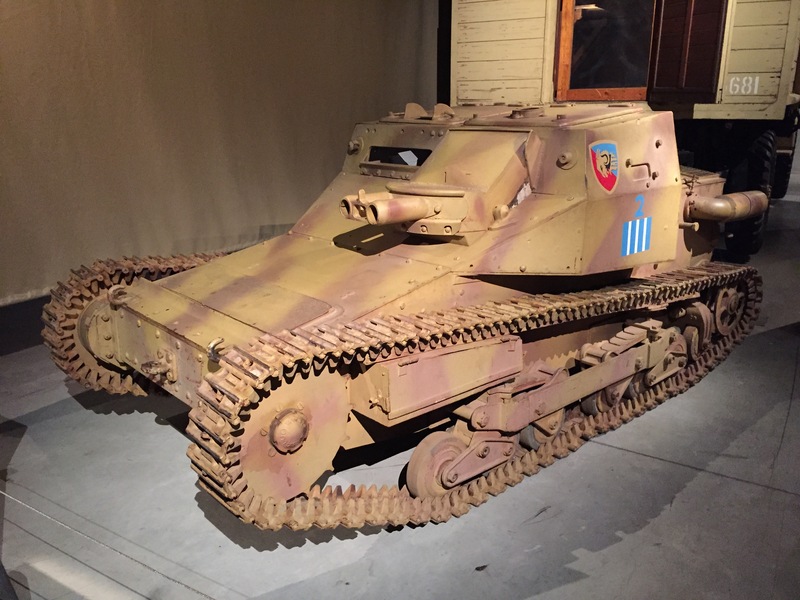 In addition a photo of an Italian CV-33 tankette, which of course illustrates the change in doctrine during the inter-war years, an aspect I find fascinating. As to Cancon itself I played in the DBA competition. A short summary of the DBA competition can be found here. In addition to my games I tried to visit a few demonstration games in surrounding areas of the convention hall. I’ve provided a few photos of one which in my mind was outstanding. 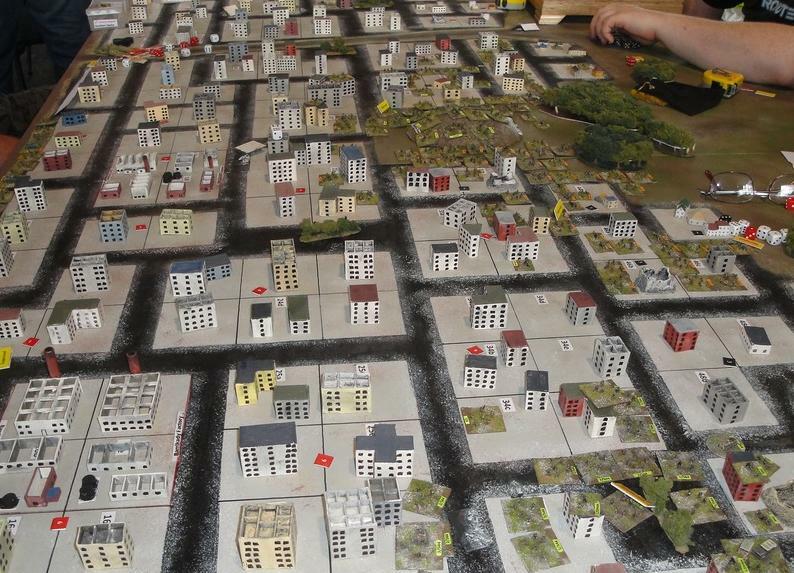 Using 3mm figures this Moderns game, with its outstanding terrain, illustrated all the advantages of the smaller scales. 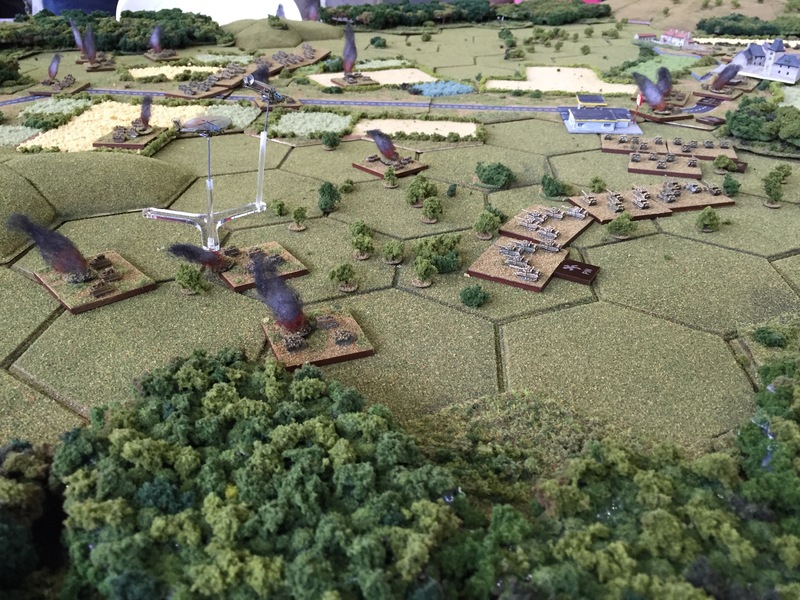 The villages, with Soviets deployed around them, looked first class and the woods well superb. Below, Americans seen advancing. Another view, taken later in the day now with helicopters in support. Natcon 2015 is to be held in Auckland New Zealand over Easter weekend. As part of Natcon Convention a 15mm DBA competition is being offered using DBA 3.0. The DBA competition will run for two days and have an Ancient day section on Friday the 3rd of April and a Medieval Section on Saturday the 4th of April. Initial details of the format are now available and can be found here. Further details including a link to the official Natcon website will be added when the official website is available. Finally I have managed to find some time to pen a few passing thoughts on Cancon 2014. Late I know, but a holiday and then a busy time on our return has a way of limiting time in front of the computer. As with previous years Cancon was an excellent wargames convention, I am very pleased to have attended in what is now my seventh convention across the ditch. As always it is a great opportunity to catch-up with friends, either playing DBR or playing in other events. As is normal with Cancon there was a large selection of trade stands, some of which I visited. However, such visits reduced my ability to visit other gaming areas and demonstartion games. As a result the photos below are, this year, of the Renaissance DBR competition area rather than other games. Firstly, we have Brian Sowman, on the left, and Peter Gillard fighting it out on the morning of the second day. In the background can be seen other Renaissance games in progress as well as DBMM and DBA gaming areas. To the left, but not shown, could be found a 25mm Napleonic competition which used a modifeied version of the old WRG rules. 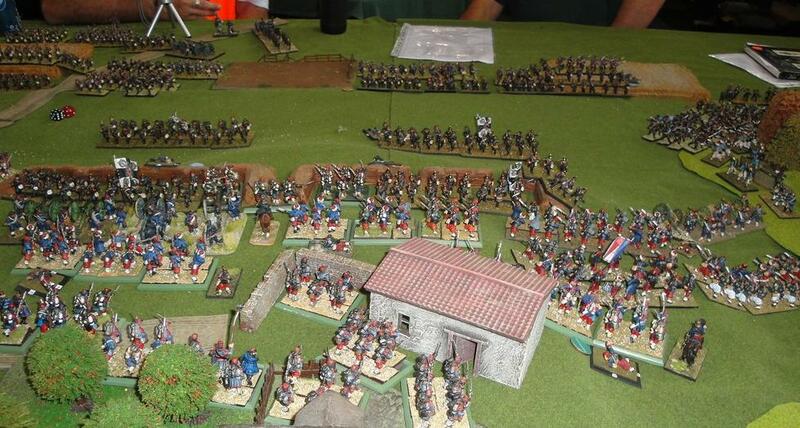 Next a couple of photos of a another Renaissance game this time between Roger Mackay’s Dutch Rebellion army and Lyle Daymond’s Russian Traditional (1631) army. Of general interest is the view of another portion of the convention area in the background. Cancon is a large convention and the tables keep flowing to the right with trade satnds to the left. Near right is the FOG Renaissance area. 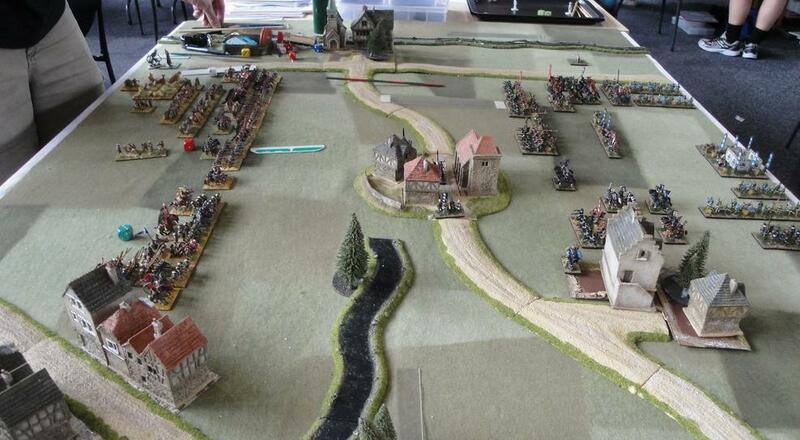 Below, another view of the previous game, this time illustrating these two well presented armies in more detail. The Russians are on the right. Now, for those interested in reading more on the subject I have just put on-line a summary of my own games in the Renaissance DBR competition. The report can be found here. 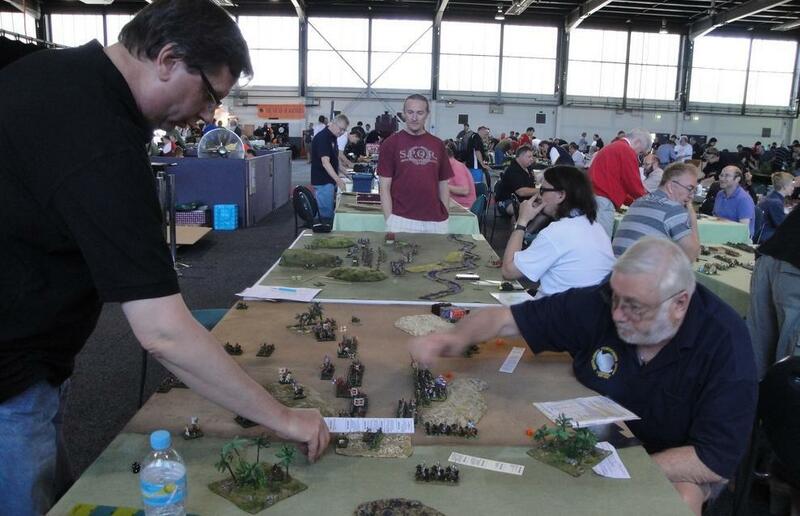 It us just a few days now until Cancon, Australia’s largest wargaming convention. 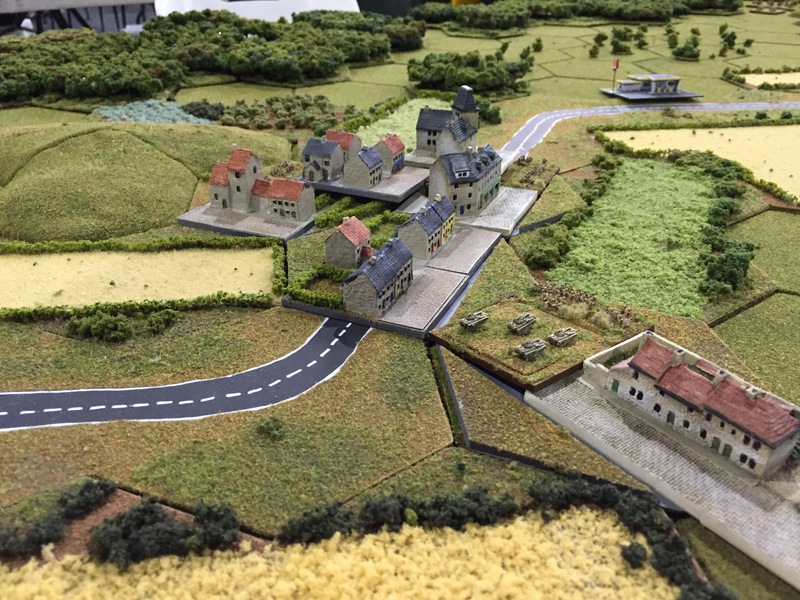 Running over three days and starting on Saturday the 25th Cancon promises to be another excellent long weekend of wargaming. The Ancient competition numbers are DBA (20), when the umpire is added in to even numbers, DBMM (12) and FOG (18). 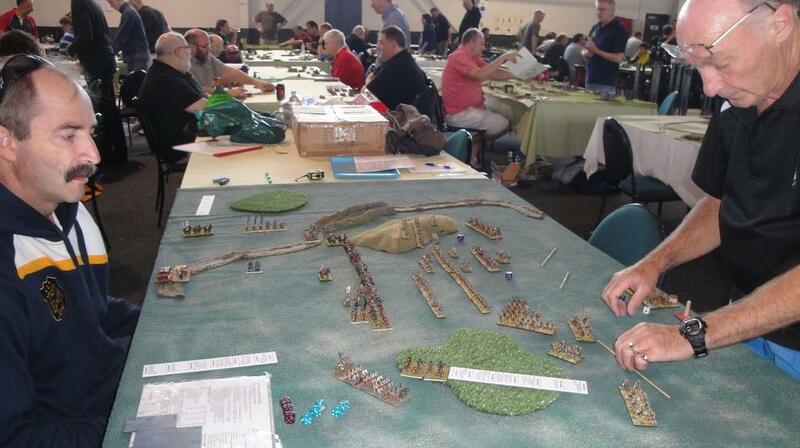 Interestingly, DBA this year pips FOG to be the most popular Ancients competition at Cancon. Of the Renaissance competitions two rule sets are on offer. DBR, which I am playing in, has eleven players. FOG Renaissance is also well supported with ten players. Of course there are many other competitions on offer, some with extremely large player numbers. For my part I don’t expect to win many games, the cost of taking a relatively complex army. Made worse by the fact I have only just finished painting it a couple of days ago! Still winning is not high on my list of aims. Rather, and this is the draw card to Cancon, I’m looking forward to playing a series of enjoyable games with some old friends on well presented tables. 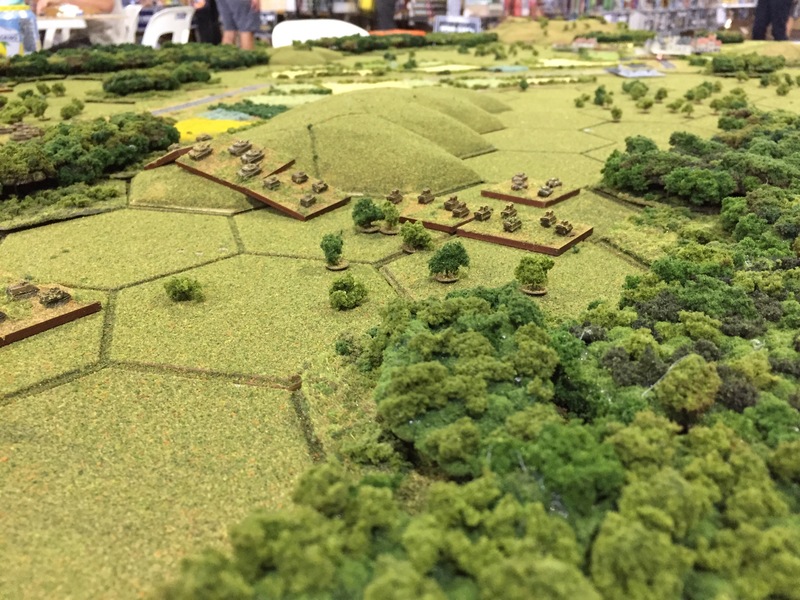 Indeed, the DBR organisers at Cancon use pre-set terrain and they have invested heavily in improving the quality of the terrain over the years. The result is a series of interesting and visually pleasing tables to play on. A far cry from the tatty tables that are too often seen on competition tables. I am arguably a little late with this but I still thought it worthwhile to post a few reflections on Cancon 2013 which was held in late January in Australia. As with previous Cancon’s I have travelled to this one was massive, at least based on New Zealand conventions. The halls, of which there were at least three, were filled to overflowing with a range of miniature and board-game competitions as well as a reasonable number of participation or demonstration games. Then of course there was an impressive range of dealers providing plenty of excuses to part with your cash. 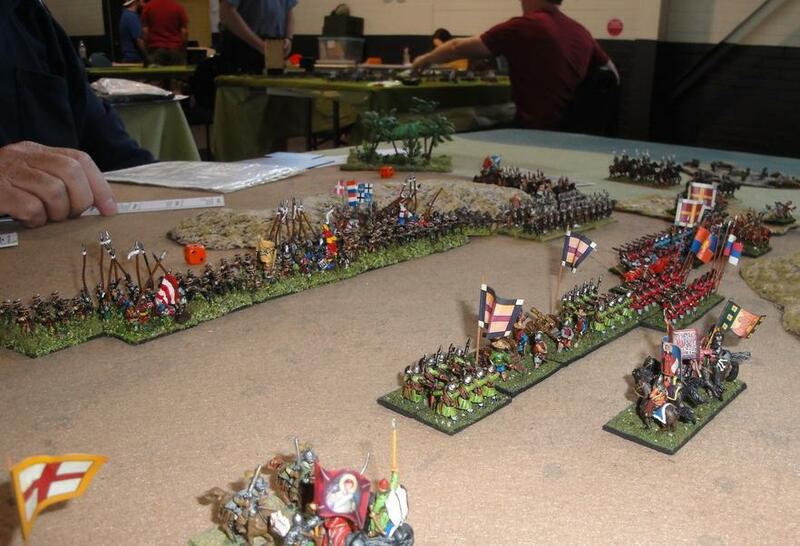 I have posted separately photos of the DBR competition, in which I was playing, which includes several game photos. You can find this report here. Without doubt the Renaissance DBR competition was enjoyable, as always. However, over lunch breaks I also managed to have a quick look at some of the participation games on show. 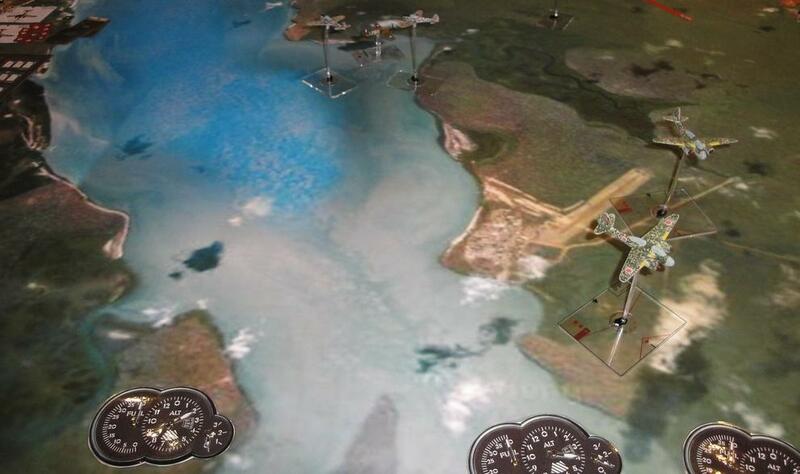 Not far from the Renaissance tables was a large 6mm Spearhead game based on Stalingrad. I had a quick chat to the players but I don’t think they grasped the fact I played Spearhead. There Stalingrad game was fought twice, once on Saturday and again on Sunday, with players switching sides each day. I didn’t get sufficient time to get back during the course of the day to investigate progress. If you are familiar with Spearhead the number of town sectors looks daunting! If I recall the orientation correctly the Germans were advancing from the right of the table. In contrast the Soviet forces, at least when I visited, were only deployed when German forces entered a specific town sector. 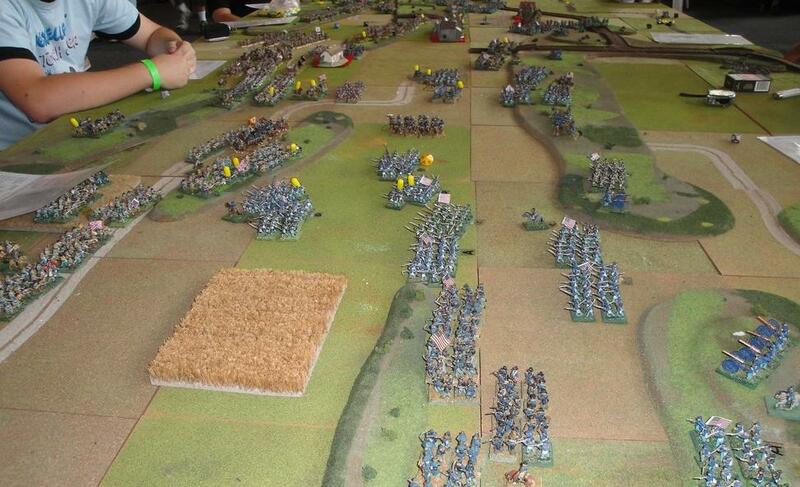 Not far from the Spearhead table was a 15mm Gettysburg game which I believe was using the Fire & Fury rules. I suspect the group hosting this game were from Sydney as in previous years I have seen their terrain boards at MOAB which is held in Sydney. I’m not sure if they were fighting one day or all three. Just time for a quick look before moving on. Just across from the Gettysburg table was a 25mm Franco-Prussian refight of a portion of the battle of Froeschwiller, fought on the 6th August 1870. The models all looked great, if you enjoy 25mm figures. I didn’t have time to determine the rules in use. Skipping over the Boxer Rebellion and Zulu participation games I headed to the Wings of War tables in an adjoining hall. I managed a short discussion with the chap running the Wings of War (WWII) who was clearly a real enthusiast. He ran, over three days, a series of games covering the Japanese attacks on Darwin. 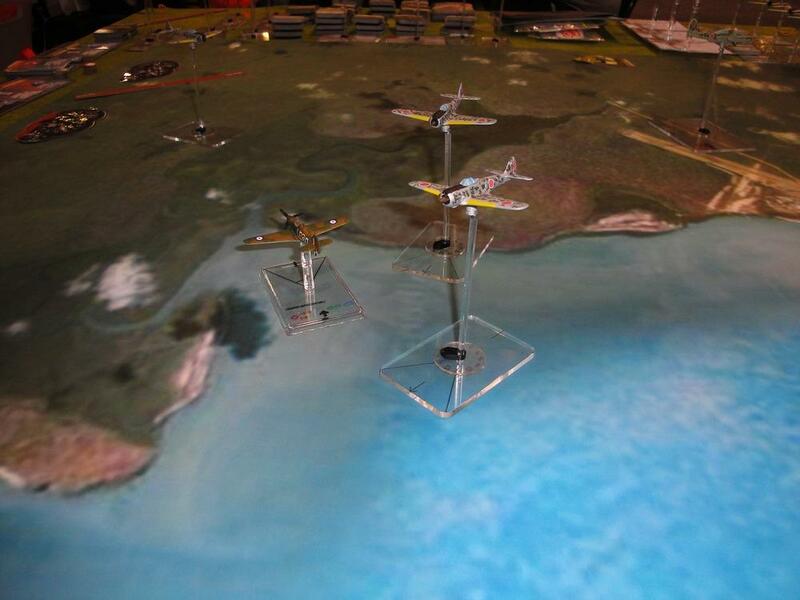 These games were complete with a number of unofficial models all organised for Wings of War. The spectacle, including printed maps of the Darwin area, looked superb. Above and below a couple of photos of one of the sceanrios clearly showing one of the A0 printed maps, sourced from google maps, which provided the backdrop for the games. In addition below some of the homemade player aids can be seen. These were designed to increase the player experience.